“Eventua lly, I think Chicago will be the most beautiful great city left in the world.” Frank Lloyd Wright said this of the city he helped shape with his amazing architecture. Millions of people come to admire Chicago every year for its art, food, parks, sports and amazing skyline. However, what brings true beauty to Chicago is its people. Young and old, rich and poor – every person plays a critical part to the intricate web of the city. The amount of cultures in the city can make you feel as if you’re travelling from country to country in a matter of miles. 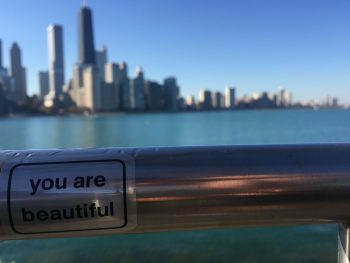 And while there are a variety of differences among its people, everyone is more than proud to call themselves a Chicagoan. This semester, I’ve gotten to witness the people of Chicago rally together around a common cause – THE CUBS! What an exciting time it was to be in the city. 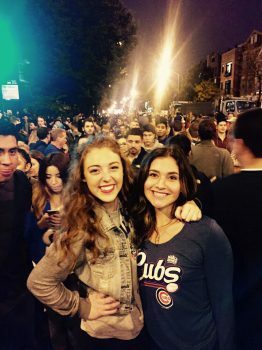 People came from all over Chicago to celebrate in Wrigleyville immediately following the long awaited victory and everyone was elated for weeks afterwards. At the parade and rally, over 5 million people flooded the city of Chicago. According to some random fact I saw, it was the 6th largest gathering in human history. However, this elation died down for many people about a week later following the presidential election. Again, I got to see the people of Chicago unite but this time to protest outside of Trump tower. The city generally votes Democratic and many people were troubled with the results of the election. People were fearful of what may happen to them because of their race, religion or sexual orientation. However, the p eople of Chicago are resilient and will work hard to make sure their rights are protected. 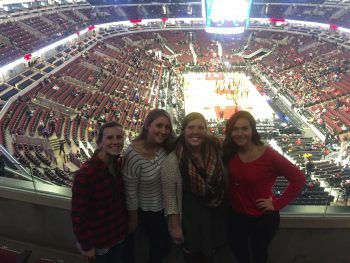 As the semester is winding down, I have gotten a chance to reflect on my time in Chicago. When I first moved in, I was a bit nervous. People are constantly telling you that this city is dangerous, torn apart by violence. While areas of the city are faced with this struggle of violence, one cannot categorize all of Chicago this way. There is so much happiness and hope all over the city, even in neighborhoods more heavily affected by crime and poverty. This semester, I have gotten to spend a large amount of my time as an intern at Children’s Place Association. They work to build a secure and hopeful today, so children facing health issues and poverty succeed tomorrow. The children and parents I work with on a daily basis inspire me with their resiliency and spirit. I will truly miss them and the staff when my time here is done. Lastly, I am grateful for the amazing friendships I have made through Chicago Semester. The amount of memories we have made in such a short amount of time is incredible. We got to enjoy the beach, experience the various art in the city, celebrate the Cubs, shop down Michigan Avenue, eat too much good food, explore new neighborhoods, volunteer together and most recently, attend a Bulls game. Through all of this, there were endless laughs and smiles. My new friends helped make Chicago feel like home these past couple of months for a small town girl trying to navigate her way in the big city. Chicago Semester is one of the greatest opportunities I have had at my time at Hope College. It has changed my perspective and continued to open my mind. While I am excited to go back to Hope for my last semester of college, I will greatly miss the beautiful city of Chicago and all of its people.